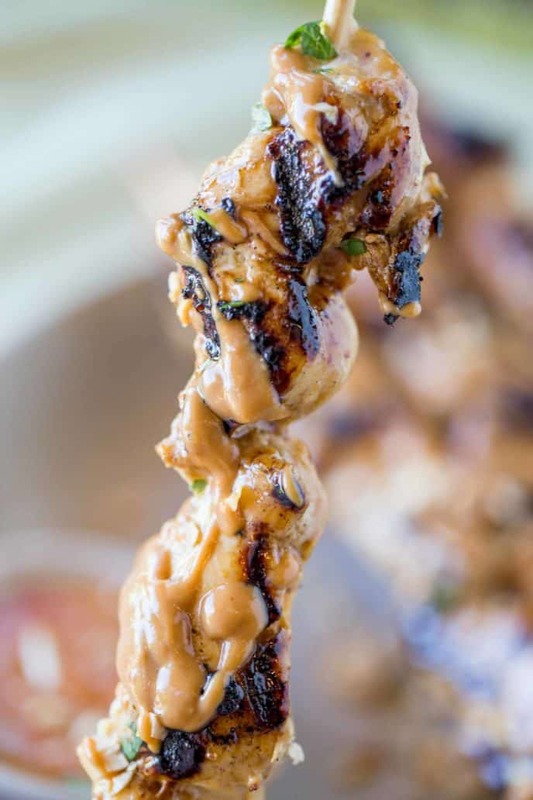 Chicken Satay skewers with the easiest peanut sauce is both authentic and approachable for kids too! So delicious you’ll skip the Thai food delivery! Thai recipes are a huge hit in our house including the fan favorites Easy Pad Thai and Pad See Ew (Thai Stir Fried Noodles). We’re totally creatures of comfort around here. If you were to work at one of our favorite delivery options you’d know our order the second you heard our voices. When it comes to ordering Thai food the kids are ALL about chicken satay. 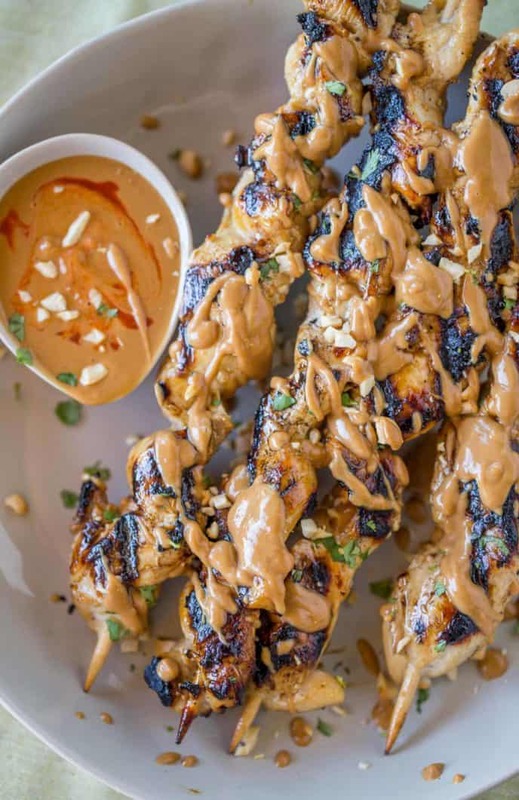 Chicken satay is sweet, salty, savory and tangy. The peanut butter is creamy, slightly spicy and citrusy with both lime juice and zest in the peanut sauce. We’ve created many different versions of peanut sauce including peanut sauce with coconut milk, but this version is genuinely the easiest peanut sauce ever without even needing the coconut milk. The best chicken satay uses an ingredients like fish sauce and lemongrass. I actually love cooking with fresh lemongrass, but I find it hit or miss when I am cooking for clients who don’t have local Asian grocery stores. To combat the issues with finding lemongrass I actually use dried lemongrass in this recipe and it works PERFECTLY. You can of course use fresh, I’d say about a 2 inch piece of fresh lemongrass would be plenty. To bring a bit of sweetness to the recipe we use brown sugar. Brown sugar is great in this recipe because it has a deeper flavor from a bit of molasses and it melts well into the marinade and caramelizes well during the grilling. I use chicken breasts in this recipe because we’re grilling on skewers and it’s quick with high heat. If you’d prefer to bake this recipe or use thighs just make sure you’re cooking long enough to cook through the chicken. Often when putting chicken on a skewer people will overload the skewer and push the pieces of chicken together. Use caution in how much chicken you add to the skewer. Make sure there is a small space between the pieces of chicken. Soak the wooden skewers before grilling them. I start soaking before doing anything else, then just thread the chicken on. No need to dry them. 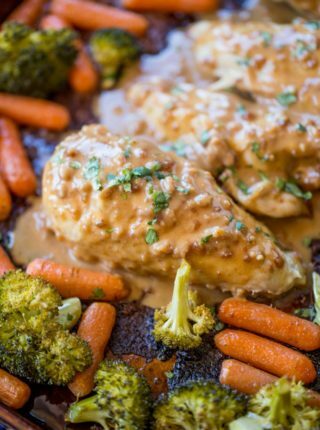 If you have found this recipe in time, the longer you marinate the chicken, the better the flavors. I try to give it a full 24 hours. 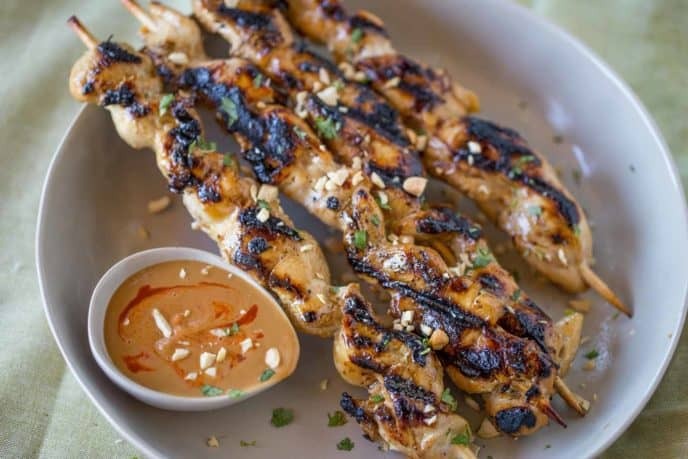 How long to grill chicken satay? Try not to overcook, white meat chicken will tend to dry out before dark meat. Just a few minutes on each side is plenty. Looking for a fun presentation, I dressed them up with chopped cilantro, crushed peanuts and a swirl of Sriracha in the dipping bowl. Marinade the chicken satay as described for 30 minutes. Bake the chicken for 18-20 minutes, turning halfway through the cook time. 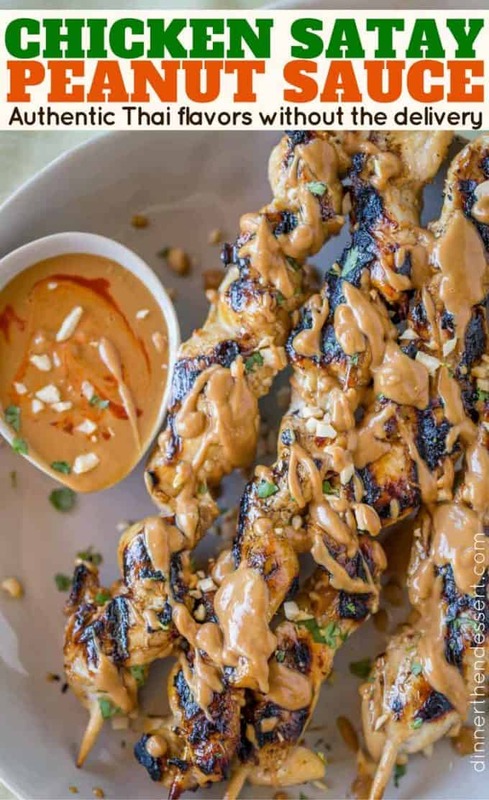 The marinade in this recipe may seem overly complicated but the flavors of Chicken Satay are authentic to Thai cuisine which has a very floral and tropical flavor. We’ve created many different versions of peanut sauce including peanut sauce with coconut milk, but this version is genuinely the easiest peanut sauce ever without even needing the coconut milk. The ingredients for the marinade may seem hard to find but I’ve included sources for them below. The use of coconut milk, lemongrass and fish sauce in Thai cooking are very popular. In fact if you’re looking for a peanut sauce with coconut milk you can add 1/4 cup unsweetened coconut milk to the recipe below. Puree all the ingredients together until smooth before serving. What do you serve with chicken satay? 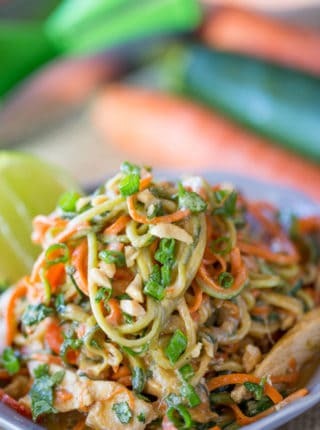 We love to serve with roasted or grilled vegetables, steamed coconut rice and Healthy Thai Peanut Chicken Zucchini Noodles. Dried Lemongrass: All the flavor with all the convenience. Dark Soy Sauce: Brewed longer and with a thicker texture the flavors are not saltier than soy sauce, they’re more like a marinade. 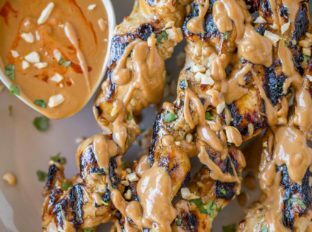 Chicken Satay skewers with the easiest peanut sauce is both authentic and approachable for kids too! So delicious you'll skip the Thai food delivery! Soak your wooden skewers in water. Add all the ingredients from the chicken marinade except for the chicken in the food processor and puree until smooth. 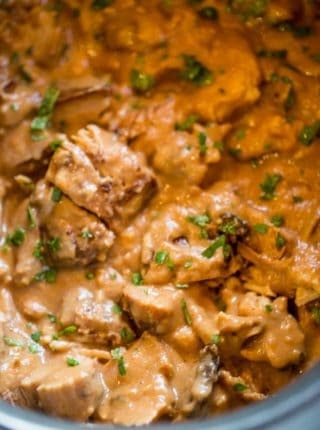 Add the marinade to the chicken pieces and let marinate for as long as possible (30 minutes minimum but ideally one day). Thread each piece of chicken onto a wooden skewer (about 6-8 pieces on each one). Cook on a grill or grill pan over high heat for 2-3 minutes per side. To make the peanut sauce add all the ingredients of the sauce together in a small food processor and puree until smooth. Would love to make this for a party. How many skewers can you fill with 2 pounds of chicken? I am planning to use tenderloins to reduce chopping required, so curious how many multiples I’d need to do about 60 skewers? I would think you’d need to make about 5-6 times as much to fill 60 skewers. Have a great party! Love most of your recipes, but this one was just okay. Our family of spice-lovers found the flavors in this one to be off-balance. The coriander in particular seemed really strong. We did like the peanut sauce though. I’ll probably try again, tweaking the seasonings a bit. Love this recipe. I’m wondering if it would work using Shrimp for the Satay??? Really delicious! Made double batch of marinade for 6lb chicken, then cooked in instant pot. Substituted 1Tbsp ea lemon & lime zest for lemongrass (per batch marinade) “sauce” left after cooking this way good on rice/salad. This is the perfect recipe for Summer! My family would love this! These look so perfect! Yum! I bet this is SO flavorful!! This is so easy and delicious! A regular in our weekly menu! This is one of my favorite ways to eat chicken. 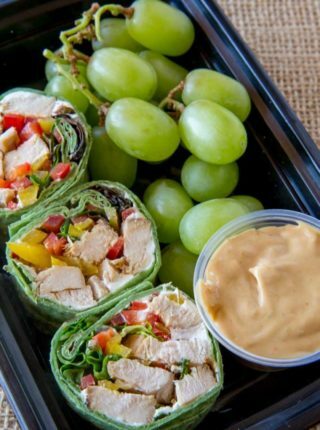 This looks so flavorful and delicious. I appreciate the tips on using skewers to grill the chicken. I want this for dinner tonight….and I’ll take EXTRA of that yummy sauce!!! So easy and so tasty! I love everything peanut butter! 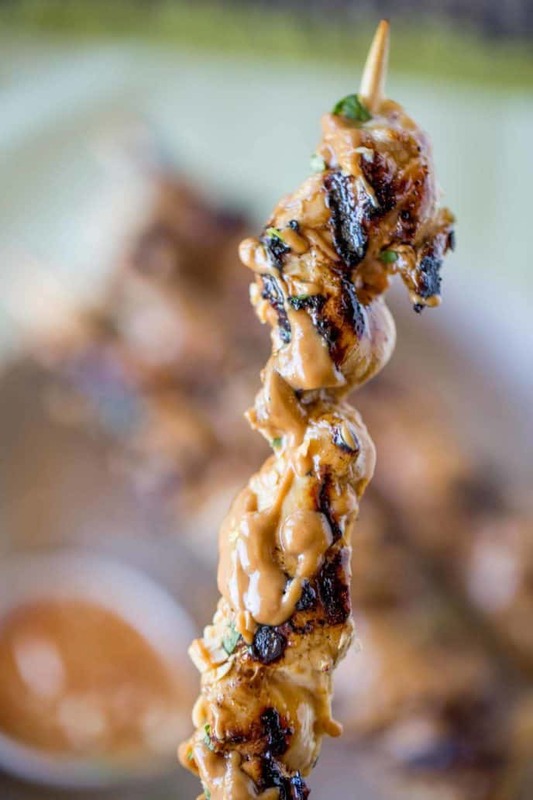 That is one fantastic looking chicken satay recipe! I love that peanut sauce! This is one of my favorite meals to get at restaurants. This looks so easy and delicious to make at home! It really is so easy! Enjoy!! You have no idea how much I love peanut Sauce! yum!